In 1974, the world was not yet overrun with digital cameras, cell phones, and DVRsthat could record anything in an instance. Maybe that was a good thing in 1974, because when news reporter Christine Chubbuck took her life in a very public way not many people witnessed it. She deserves to be remembered for her achievements as reporter and not the horrible and sad way her life ended. Born in Hudson, Ohio on August 24, 1944, Christine Chubbuck attended the Laurel School for Girls in Shaker Heights, a suburb of Cleveland. 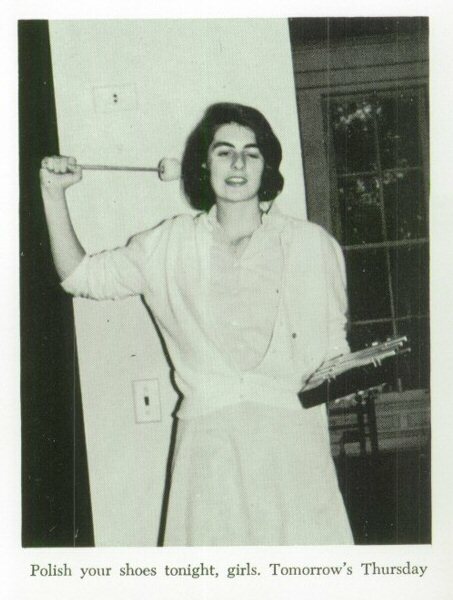 During her years at Laurel, she started a small tongue-in-cheek group called the "Dateless Wonder Club." She attended Miami University in Oxford, Ohio for one year, majoring in theatre arts, then attended Endicott College in Beverly, Massachusetts before earning a degree in broadcasting at Boston University in 1965. She worked for WVIZ in Cleveland for a year in 1966-67, and attended a summer workshop in radio and television at New York University in 1967. 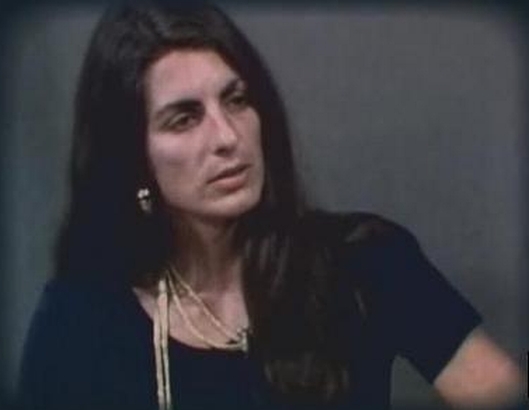 Also in 1967, Chubbuck worked for a few months for public television stations in Pittsburgh, Pennsylvania and Canton, Ohio before moving on to spend four years as a hospital computer operator and two years with a cable television firm in Sarasota, Florida. Immediately before joining WXLT-TV (now WWSB), she worked in the traffic department of WTOG in St. Petersburg, Florida. WXLT-TV owner, Bob Nelson, had initially hired Chubbuck as a reporter, but later gave her a community affairs talk show, Suncoast Digest, which ran at 9:00 in the morning. Production Manager Gordon J. Acker described Chubbuck's new show to a local paper: "It will feature local people and local activities. It will give attention, for instance, to the storefront organizations that are concerned with alcoholics, drug users, and other 'lost' segments of the community." Page five of the article showed a smiling Chubbuck posed with an ABC camera. Chubbuck took her position seriously, inviting local Sarasota–Bradenton officials to discuss matters of interest to the growing beach community. After her death, the Sarasota Herald-Tribune reported that Chubbuck had been nominated for a Forestry and Conservation Recognition Award by the Bradenton district office of the Florida Division of Forestry. She was considered a "strong contender" by Mike Keel, district forester, who had been scheduled to appear as a guest on Ms. Chubbuck's show the morning of her suicide, but had cancelled because of the birth of his son. Chubbuck spoke to her family at length about her struggles with depression and suicidal tendencies, though she did not inform them of her specific intent beforehand. She had attempted to overdose on medication in 1970 and frequently made reference to the event. She had also been seeing a psychiatrist up until several weeks before her death. Chubbuck's mother chose not to tell station management of her daughter's suicidal tendencies because she feared she would be fired as a result. Apparently, she had an unrequited crush on co-worker George Peter Ryan. She baked him a cake for his birthday and sought his romantic attention, only to find out he was already involved with sports reporter Andrea Kirby. Kirby had been the co-worker closest to Chubbuck, but she was offered a new job in Baltimore, which had further depressed Chubbuck. Chubbuck's lack of a romantic partner was considered a tangent of her desperate need to have close friends, though co-workers said she tended to be brusque and defensive whenever they made friendly gestures toward her. She was self-deprecating, criticizing herself constantly and rejecting any compliments she was given. Three weeks before her death, she had asked the station's news director if she could do a news piece on suicide. After her suggestion was approved, she visited the local sheriff's department to discuss with an officer methods of suicide. In the interview, an officer told her one of the most efficient ways was to use a .38 caliber revolver with wadcutter target bullets, and to shoot oneself in the back of the head rather than in the temple. 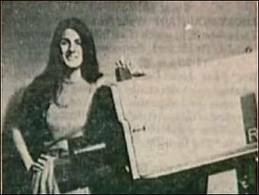 On the morning of July 15, 1974, Chubbuck confused co-workers by claiming she had to read a newscast to open her program, Suncoast Digest, something she had never done before. That morning's talk show guest waited across the studio while she sat at the news anchor's desk. During the first eight minutes of her program, Chubbuck covered three national news stories and then a local restaurant shooting from the previous day. The restaurant was the Beef and Bottle Restaurant at the Sarasota-Bradenton Airport on U.S. 41. 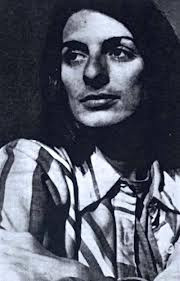 The film reel of the restaurant shooting had jammed and would not run, so Chubbuck shrugged it off and said on-camera, "In keeping with Channel 40's policy of bringing you the latest in blood and guts, and in living color, you are going to see another first—attempted suicide." She drew the revolver and shot herself behind her right ear. Chubbuck fell forward violently and the technical director faded rapidly to black. Camera operator Jean Reed later recalled she thought it had been an elaborate prank and did not realize Chubbuck had actually shot herself until she saw Chubbuck's twitching body. Chubbuck was taken to Sarasota Memorial Hospital, as her script had predicted; there, she was pronounced dead fourteen hours later. 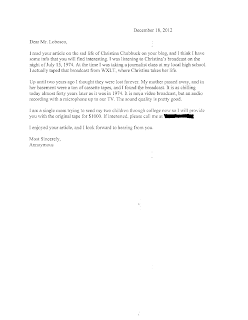 Upon receiving the news, a WXLT staffer released the information to other stations using Chubbuck's script. Chubbuck's body was cremated. The funeral ceremony was held on the beach where her ashes were scattered into the Gulf of Mexico. Approximately 120 people attended, including local officials who had appeared on her show. Three songs by Chubbuck's favorite singer, Roberta Flack, were played. Presbyterian minister Thomas Beason delivered the eulogy, stating "We suffer at our sense of loss, we are frightened by her rage, we are guilty in the face of her rejection, we are hurt by her choice of isolation and we are confused by her message." UPDATE 1/26/16: I haven't updated this article in awhile, but it has been four years since I got the strange letter above, and it was definitely a hoax. The number this letter writer gave me was disconnected shorly after I got the letter. From the phone number, it was a cell phone number from San Diego, California. The search continues on. While perusing the internet in search of famous last words, I stumbled upon those of Christina Chubbuck. I'd never heard of her before today. This led me to look into her a bit more. Lo and behold, here is your article - posted just 3 hours prior to my searching. A very strange coincidence. Her death made a big enough impression on me at the time that I wrote about it in my Daily Journal at age 15. "... said the only existing footage of the sad events was destroyed in the late 1980s." Really? I must have heard 6 or 7 different versions of what supposedly happened to the video. I'm not convinced that this video doesn't exist, because I think I saw part of it (the non-violent part) in an ad on TV many years ago. It was on an extended ad for one of those "Most Shocking Videos" VHS things, before the prevalence of the internet. In the clip, Chubbuck(?) gave her speech to the camera, and it paused with her putting the gun to her head. Then it cut to the next scene. What I saw could have been a re-creation, though. I've heard that one ^ many times, yet no one can ever come up with a title of said video. Regarding the letter: I don't want to be a downer, but there's a chance this could be a scam. I'd insist on hearing the tape first. *IF* it's legit (and I have my doubts), I'd be willing to chip in a little bit for the cost. There are other "lost media" enthusiasts who'd like to hear this footage, too. WXLT was in Sarasota Florida. I don't think they have basements there. don't know why nobody wanted to be romanticly involved with her she's not a bad looking woman with a nice body. wishI knew her then. Looks arent everything aparently she was a feminist and very definesive and anti social so that could have been a main reason why she was single looks arent everything if you cant stand the person or like their personality what do looks matter. But many people are rather defensive and somewhat anti-social. It doesn't mean that they are trying to be hateful or snobbish. They are just trying to protect themselves from being hurt by others. Christine was extremely intelligent and she was indeed a feminist. She cared deeply about Human rights and often called out the barbaric and cruelness in our society. If that turns some people off, it is they who have the problem. I realize that I am a little late to the party, but I wouldn't give that letter a second look. Someone is trying to scam you. Her name wasn't "Christina" Chubbuck. It was Christine. And her broadcast wasn't in the evening, it was in the morning. Someone is trying to steal from you. She shot herself in a broadcast on July 14, 1974 and died on the 15th. 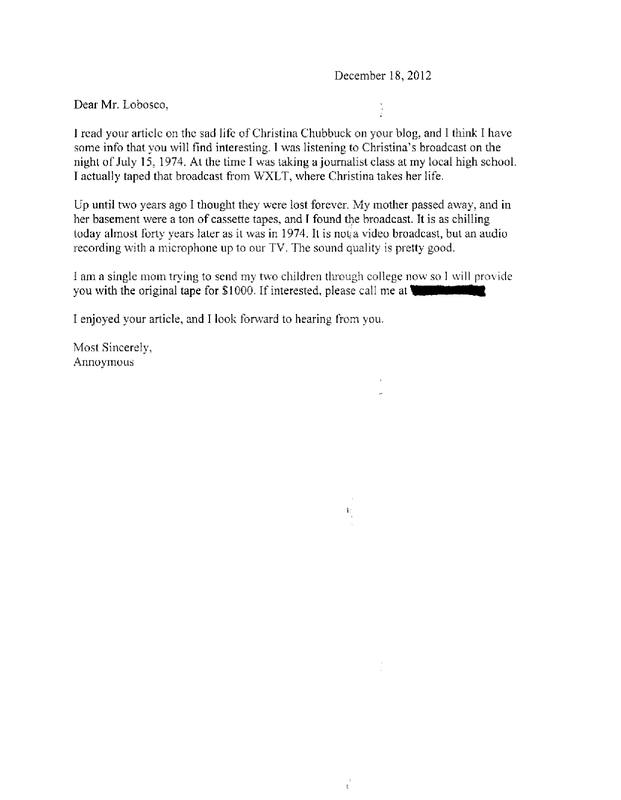 The letter from "anonymous" got the date of the broadcast wrong. When I went to call back this person, the number was disconnected. I think it was a hoax. You still don't have the tape ? I watched the video on the Internet after searching for it for a couple of hours back 2008-9. I'm an IT person so advanced search tricks certainly helped and I do regret no saving it to my HD. Once she says her famous last words she fires with her right hand near the ear and slumps forward on the desk. Her long hair hides any gore. The video DOES exist and it WAS online make no mistake. I just wish people would STOP saying that it doesn't exist because it's not true. Then what site was it then? Who cares about a video of it. Are people that sick minded, that they would get into watching it? And this woman wants $1000 for listen to a 'possible' audio of it. Why would her mother have taped it? And if it were true, especially since this woman wants money from you, I'm sure she would've gone to some bigger money sources, not someone who has a blog. As an unrelated new bit, Christine's father - George Fairbanks Chubbuck died on January 16, 2015 at the age of 96 of natural causes. I like the idea of going back in time to save her. I'd set the DeLorean once to go to Sarasota and see the broadcast on TV (just because that's been a curiosity for too many years), and then I'd set it again for further back and just go back a year and try to befriend her and to warn her family of how serious her depression really was. Hey, I might decide I like the 70's better anyway. I think I would. It seems that the only existing copy of the original video has been located, have you read the news? it is very, very possible that a copy of this footage was made and has floated around since- in the hands of very few morbid and curious people. I wouldn't want to be one of those people but nothong is sacred. Most likely source of a leak would be an underling in the police department or law office entrusted with "safe keeping" amd I am 99% sure you can find it on the more seedy parts of the interwebs. We had a guy shoot himself at our local gun store recently. I think public suicide comes from a place not just of deep sadness but intense rage. I am sure her coworkers, the few people tuned it and family had ptsd from that. There is a new movie based on her streaming on Netflix- "Christine"
I saw the movie documentary of Christine Chubbuck. I can't understand this young woman refused to take medication for herself and decided to let her bipolar/depression put her in a quicksand sink hole that is so deep no ladder or a piece of rope would help bring her back up to the surface. I suffer from bipolar/depression like she did. I had a father that was diagnosed with the same learning disability as me, Asperger Syndrome, and he and I were close. I watched him pass away at my own home with nobody else around to help me bring him back. I can understand her frustration of not having a male individual in her life to love her back. Christine seemed too focused on getting stories to be put on the air...wanted to be someone worth remembering but not stepping back from radio broadcast to find out what's wrong with herself. The fights between her mother kind of remind me about the same fights I do with mine. However, I'm working hard to not try and do that to my mom. We might have different opinions, different ideas, different ways of living our lives, but that doesn't mean that we can't have a positive connection. She's done so much for me that the list keeps going on and on. I'm not going to blame her for what she did to herself. However, I wished her manager would have cut her some slack. For those out there similar to Christine Chubbuck, don't do this to yourself.